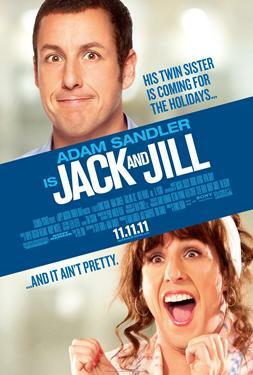 Jack and Jill is a comedy focusing on Jack Sadelstein (Adam Sandler), a successful advertising executive in Los Angeles with a beautiful wife and kids, who dreads one event each year: the Thanksgiving visit of his identical twin sister Jill (also Adam Sandler). Jill's neediness and passive-aggressiveness is maddening to Jack, turning his normally tranquil life upside down. Katie Holmes plays Erin, Jack's wife.